The eect of Melatonin, luzindole, and EX527 treatment on apoptotic index, infarct size, lactate dehydrogenase (LDH) release, and CK release in IR-injured hearts. Representative photomicrographs of in situ detection of apoptotic myocytes by TUNEL staining. Green ﬂuorescence shows TUNEL-positive nuclei; blue ﬂuorescence shows nuclei of total cardiomyocytes; original magniﬁcation 9x400. Sacle bar: 100 um. Effects of Cap pretreatment with or without coadministration of sirtinol on the activities of caspase-3 in the rat primary cardiomyocytes after A/R. 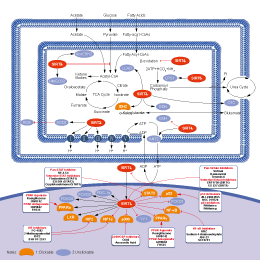 A/R induced a significant increase in the activities of caspase-3. Cap significantly decreased the change in the activities of caspase-3 caused by A/R, and sirtinol significantly blocked the effects of Cap. Values were expressed as the mean ± SEM (n = 6). ∗∗P < 0.01 versus the control group; ▲▲P < 0.01 versus the A/R group; ##P < 0.01 versus the Cap + A/R group. Immunoprecipitation-western blot for analyzing acetylated Snail in Snail-transfected 293T cells (upper) and FaDu-Snail cells (lower) treated with a vehicle control (Ctrl), a HDAC inhibitor TSA 5 nM for 8 hr, a SIRT1 inhibitor NAM(Nicotinamide) 10 mM for 8 hr, or in combination. AK 7 is a brain-permeable selective SIRT2 inhibitor with an IC50 of 15.5 μM. Tenovin-6 is a small molecule activator of p53 transcriptional activity. Thiomyristoyl is a potent and specific SIRT2 inhibitor with an IC50 of 28 nM. It inhibits SIRT1 with an IC50 value of 98 μM and does not inhibit SIRT3 even at 200 μM. Salermide is a reverse amide with a strong in vitro inhibitory effect on Sirt1 and Sirt2. Compared with Sirt1, Salermide is even more efficient at inhibiting Sirt2. 3-TYP is a selective SIRT3 inhibitor which is selective for Sirt3 over Sirt1 and Sirt2. The IC50 values for SITR1, SIRT2, SIRT3 are 88 nM, 92 nM, 16 nM respectively. CAY10602 is a potent SIRT1 activator. Salvianolic acid B (Sal B), an antioxidant and free radical scavenging compound, is the most abundant bioactive compound extracted from the root of Salvia miltiorrhiza Bunge. SRT2183 is a small-molecule activator of the sirtuin subtype SIRT1, currently being developed by Sirtris Pharmaceuticals. After starved in serum-free medium for 24h,A549 cells incubated with the indicated concentrations of Quercetin for 3h,followed by 20-minute stimolation of 100ng/ml EGF. Liver pathology and serum markers of liver injury in mice fed control (Ctrl), or ethanol (EtOH), or ethanol combined with fisetin (E/Fisetin) diet for 4 weeks. (A) Light microscopy with hematoxylin and eosin staining shows lipid accumulation (arrows) in the liver of mice after alcohol exposure, which was alleviated by fisetin administration. (B) Plasma alanine aminotransferase (ALT) and (C) aspartate aminotransferase (AST) activities. Infinity ALT and AST reagents were used formeasuring ALT and AST activities. Scale bar: 50 lm. Results are mean±SD (n = 3 to 6). Results for bars that do not share a letter differed significantly among groups (p < 0.05). Significant differences among groups are determined by analysis of variance followed by Tukey’s test. SRT3025 is an orally available small molecule activator of the SIRT1 enzyme.